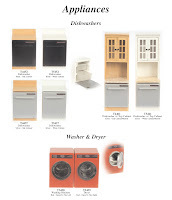 Aztec Imports has some new modern dollhouse furniture pieces for the kitchen. The pieces are a double oven cabinet, dishwasher, stove and fridge. The quality is roughly mid-level. Currently, there aren’t any other pieces to make a complete modern kitchen from the company. 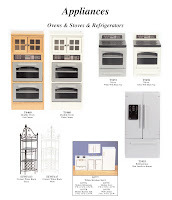 As seen in the picture above, you could use Aztec’s double oven cabinet with the Dolls House Emporium’s modern island. 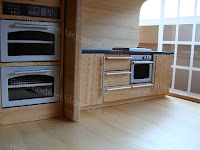 The handles on the island and oven compliment each other quite well. I think the “stainless steel” fridge would also work nicely. I’ve failed to mention this before but the island from the Dolls House Emporium is slightly off scale. It seems a bit bigger than 1:12 and closer to 1:10. This works great in the case of the modern Aztec Imports furniture because they also seem slightly larger than 1:12. I typically have to use larger figures for any scenes with the pieces to keep everything in perspective. I recently bought the fridge, and I agree, it's pretty nice and also reasobaly priced (14.99). I matched mine up with the Dollshouse Emporium blue kitchen cabinets and island. It's not quite an Elf kicthen, but, hey, it's like $400 cheaper! Yes, I DID see that fridge in your house--looks good! I too love ELF kitchens and all of her designs. I would like to buy one but cannot make up my mind what I would like from her. I wish a company would offer her a solid contract to design kitchens that they would quality mass produce at a more affordable price--so that average collectors could get more than one. Hey...not all ELF kitchens cost hundreds of dollars! (I'm ELF Miniatures - if you see what I mean!) Take a look at my Mornington Range, or the FLEXI kitchen (I do these ready-built too for well under $200, in any finish you want).